Announcement Welcome to Handmade On Half Street! A shop specializing in products from nature; wood and paper goods. Stationery, invitations, wood home goods and more. We are a husband and wife team and all items are handmade with love in Minneapolis, Minnesota. Follow along for more inspiration, stories and life-happenings on our website, Facebook and Instagram. Welcome to Handmade On Half Street! A shop specializing in products from nature; wood and paper goods. Stationery, invitations, wood home goods and more. We are a husband and wife team and all items are handmade with love in Minneapolis, Minnesota. Follow along for more inspiration, stories and life-happenings on our website, Facebook and Instagram. I purchased these for myself and loved them so much that I bought a set for a gift. They are made well and each coaster is unique. I was very impressed how quickly they shipped! I would recommend purchasing from Handmade on Half Street! Even more beautiful than expected! This handmade card is the perfect addition to my ice cream themed gift to my husband for our anniversary. 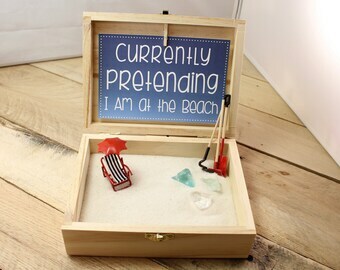 This little Beach Zen box is adorable! I live in Florida and want to send a little warmth to my sister in New Jersey. The craftsmanship is excellent, little hinge helps to lock the box securely. The carving in the wood also helps to "dress" it up from just being a plain wooden box. 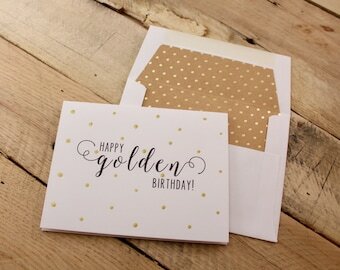 Golden birthday cards are flying out the door today! Who do you know that is celebrating a golden birthday this month? We have 20% off and FREE shipping until Friday! Prepping pallet wood for dog dish orders. 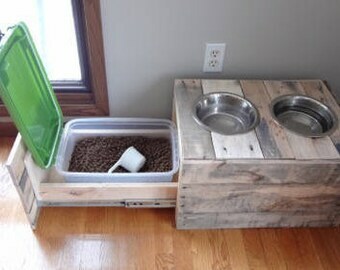 Each piece has unique wood, colors and textures. Gold foil + kraft paper envelope liners for days. 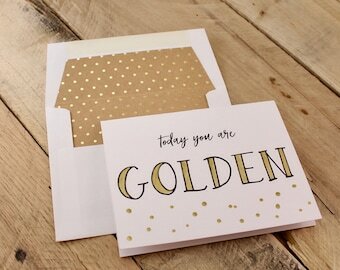 You'll find a variety of these gold liners paired with each of our golden birthday cards. Welcome to Handmade On Half Street! A shop specializing in all things coming from trees; paper and wood goods. Stationary, invitations, wood home goods and more. All items are handmade with love in Minneapolis, Minnesota. Follow along for more inspiration, stories and life-happenings on our website, Facebook and Instagram. Paper expert, wood crafting assistant and cheese lover. You will often find me in my studio, for endless hours, working on my latest project. When I’m not working you’ll find me enjoying the outdoors and spending weekends up north. Paul enjoys the art of woodworking because it allows him to create something beautiful from raw, natural wood. When he’s not covered in sawdust, you’ll find Paul at the gym practicing his jiu-jitsu or dishing out assists at the local hockey rink.